According to AARP research, aging adults prefer to remain in their own homes as they age. In fact, 90 percent of those surveyed indicated they prefer to stay in their homes and “age in place.” This holds true even when the elderly need some in-home care. For many seniors, the main concern is maintaining control over their own lives and setting their own rules and schedules, but there are often safety concerns to take into consideration, too. With a few modifications to the home, many seniors can and do remain independent as they age. Consider these important aspects of home safety. Many aging adults suffer from reduced or failing eyesight, which can lead to falls. Installing adequate lighting inside and outside the home can prevent scary falls that can lead to broken bones and trips to the ER. Night lights in dark hallways and bathrooms, easy-to-reach lamps by the bedside and extra lighting in stairwells are great places to start, but don’t overlook installing good lighting throughout the entire house. Avoid low wattage bulbs and place extra lights in dark entryways, hallways and other dark areas of the home. Check the home for extension or electrical cords that are in the line of traffic and move them safely out of the way. Tuck cords behind furniture well away from foot space. Other common culprits are rugs, slippery floors and clutter. Remove scattered rugs and always keep clutter away from walk areas. Place door mats near the front door to absorb rain and snow and prevent slippery surfaces. Replace flooring with non-slip flooring and make sure the stairs have adequate treads to prevent slips and falls. If possible, modify the entrance to the home to eliminate steps. If this isn’t possible, add sturdy hand railings to help with poor balance. But the entrance isn’t the only place where they hwill benefit from safety railings. Install hand rails near the tub or shower and next to the toilet to provide extra support. A sturdy railing is also a must for inside stairways and for around the deck. 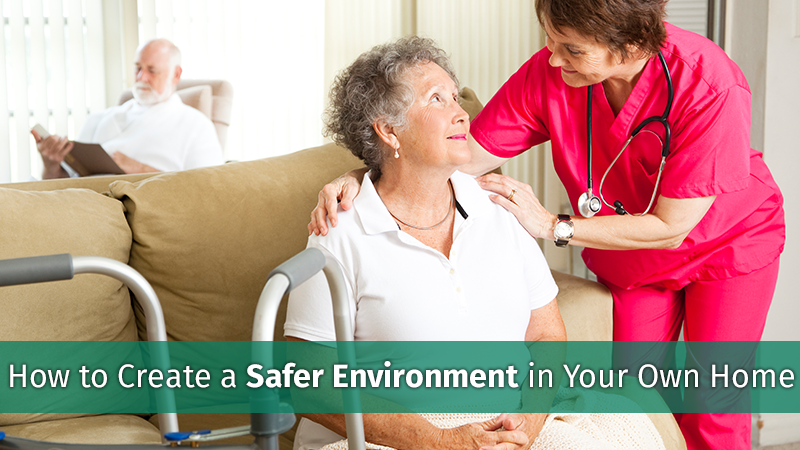 This includes medical alert systems in case your loved one slips or falls when home alone. Other options include installing a phone near the bed where it is within easy reach if he or she needs help in the night. Mature adults also benefit from a buddy system where a neighbor or friend check-in with them every day. Contracting with an in-home emergency response service or in-home care will ease worries about emergencies and ensure that help will be there when you need it. If you need help planning for aging in place, contact us today. We can guide you in making decisions to improve the safety of your home so you can remain independent as long as possible. We are hosting informational seminars throughout the month of October. Our team would love to meet you and see if we would be a good fit for your family.